A scan of the images from an article from the People's Journal. 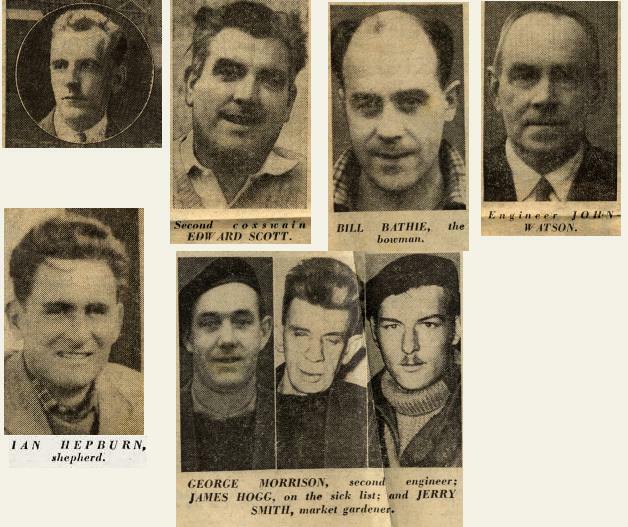 Top left Albert Watson, Edward Scott, Bill Bathie, John Watson, Ian Hepburn, George Morrison, James Hogg and Gerry Smith. Jerry's Market Gardening experience led to further fame later in his career. I still have a copy of the original Press & Journal which carried the story of the "Servus" rescue. As well as several other Cromarty "artefacts" all of which were passed on to me after my mother, Mary Colven (nee Scott) died in 1992. Her brother, Eddie Scott was my uncle. I recall many childhood memories of summers spent in Bayview Crescent. Although I left the Highlands some 32 years ago, I still have fond memories of The Watson's, Hoggs, McPhee's and many others. My sister Sandra however, has merely crossed the Firth and has lived in Invergordon for the last 38years. Morris, Thank you for your comments on the 'Servus' rescue, sadly only 2 of that crew, I think, are still alive. My Dad Albert was Coxn. that day, back in 1959. If you look at this pic of the life-boat you will see your Uncle Eddie, as bowman, on a Regatta day in Cromarty. A copy of this photo can be made for you, gratis, e-mail me. I have found the Cromarty Library site most interesting and must look out some old photos to post.